Yes, laminate flooring is a great choice but it does have one weakness – water. While surfaces spills should not be a problem for most laminate floors, they are susceptible to moisture. That moisture can come from several sources: Surface spills that sit for longer than 24 hours, pet accidents, moisture and humidity from subfloors, and flooding. Today, several leading manufacturers have addressed that issue head on with special treatments to provide enhanced water resistance, including specially treated edges to prevent seepage into the core board. Add recommended moisture barriers and laminate flooring can be used virtually anywhere. This means you can use laminate flooring without worries in spaces like kitchens and even bathrooms. Look for warranty coverage against surface spills and even pet accidents on premium laminate flooring products. For kitchens and baths, especially, you may need the extra level of protection. In spite of all these advances, almost no laminate floor can stand up to flooding. There's one other caveat: Laminate boards are often cut to fit during installation which can leave the edges unprotected against any water that migrates to the edges of the room, so be careful. 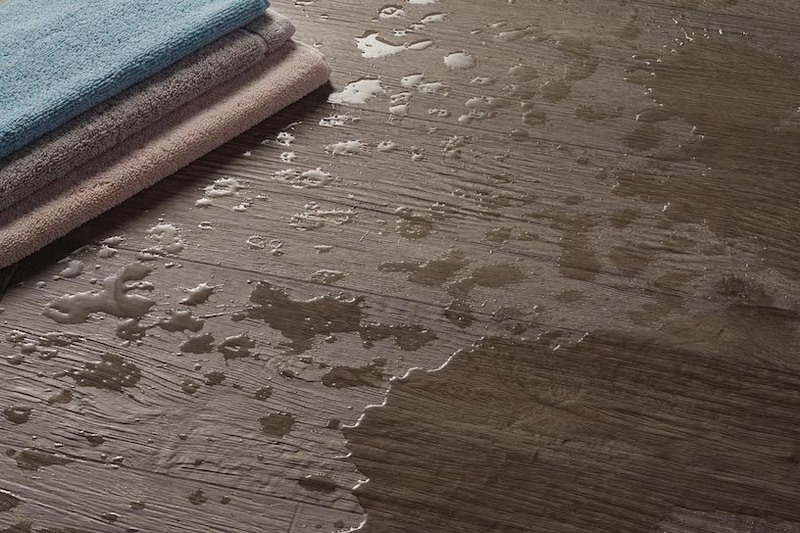 For surface spills though, water-resistant laminate is up to the task. Quick-Step offers a laminate flooring sealant.